Illustrators do warm-ups by sketching like athletes doing warm-ups by stretching. Written by Carson Ting. Posted on January 31, 2019. Filed under Drawings, Blogging. Tagged hong kong, illustration, ink. Comments Off on Illustrators do warm-ups by sketching like athletes doing warm-ups by stretching..
Much like athletes, illustrators need to do warm-ups that act like training exercises by doing quick illustrations for fun. It helps loosen fingers, the wrist and more importantly, the mind. 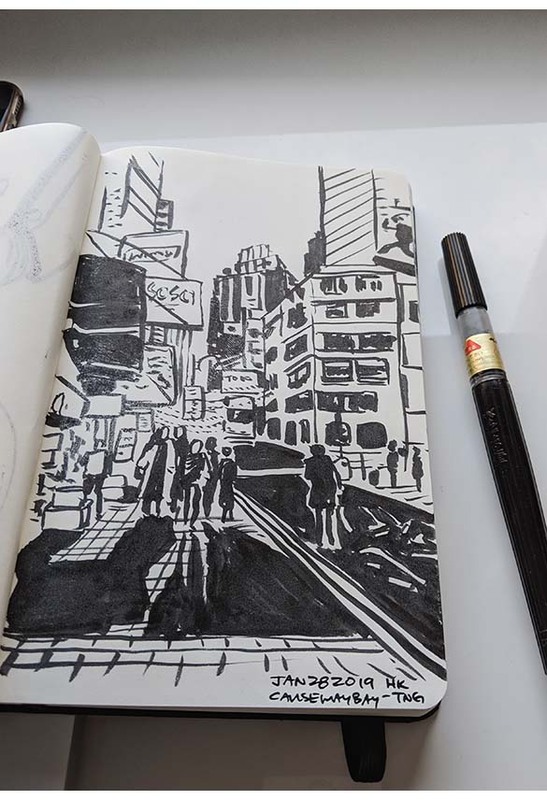 Did this quick sketch before tackling a commercial project in Hong Kong. This piece is based on a photo I took with my Google Pixel while in Causeway Bay. I ABSOLUTELY love drawing with this pental brush pen. Nothing beats the feeling of an old school brush pen hitting on Moleskine paper. Follow our adventures in Hong Kong through our IG channel. We’re here until the end of Feb.